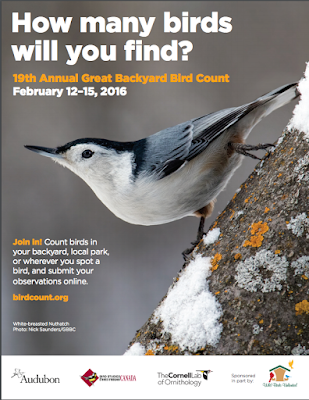 Join the 2016 annual, world-wide Great Backyard Bird Count! Since 1998, over 100,000 people have participated in this citizen-powered science project. The requirements are simple: for the period of February 12-15, set aside 15 minutes to count birds on one or more days. Then, submit your observations to the bird count website. Those new to the count will need to create an account first.